In April 2015 Artist Manss Aval was featured in the prestigious Galleria360’s Mostra collettiva Internation-ART exhibit in Italy. 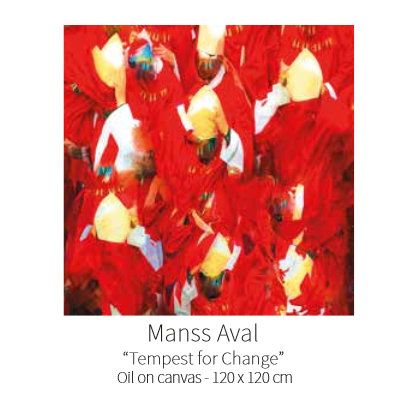 The Artist’s work, namely Tempest of Change was featured in the Galleria360 exhibit and attracted a tremendous amount of praise. The following is a review of Manss Aval’s Art by the Galleria360. technique is inspired by the artifacts and camouflage effects of the camera. A brochure of the gallery’s featured Artists and their amazing work can be seen here.